Lazy days spent in the sun at a sandy beach are what vacation day dreams are made of. Add day trips to caves, a cathedral of old-growth trees, ocean kayaking, and quirky shops (including goats on the roof), and you have the recipe for a spectacular family vacation destination. So where is this magical place? Look north to the small towns of Parksville and Qualicum Beach on the eastern shore of Vancouver Island, about 1.5 hours by ferry from Vancouver, British Columbia. The Parksville Qualicum Beach ocean-side beaches provide prime play opportunities for everyone who visits this area. Whether you’re walking along the trails, rowing a dinghy, or flying a kite in the steady breeze, there’s hours of fun to be had on these beaches, whether the tides in or way, way out. Dig sand castles? The Parksville Sand Sculpting Competition is held annually from mid-July to mid-August in Parksville’s main ocean front park. This global event is one of the biggest sand sculpting competitions in the world. If classic cars spark more interest, Qualicum Beach hosts an annual Seaside Cruizers Show N Shine on Father’s Day weekend each June. Over 600 classic and vintage vehicles invite admiration at this show, which was featured as one of Oprah’s Top 10 things to do on Father’s Day. Yes, those are goats on the roof! A short, ten-minute drive west of Parksville is the unique and quirky village of Coombs. Where else can you see the Goats-on-Roof of the Old Country Market? It has become one of the top tourist destinations in British Columbia, and the shopping at the Market and other unique shops make a memorable experience. The Market includes the amazing Coombs Country Ice Cream Shoppe, with 60+ flavors, including the local favorite, Nanaimo Bar. Nearby you’ll find the tropical paradise of Butterfly World & Gardens. Children will love the colorful and gentle butterflies as they float about and feast on fruit. There are also turtles, tropical birds, and an indoor orchid garden. Just north of Parksville is Milner Gardens & Woodland. This serene garden oasis is the creation of one woman and is now administered by Vancouver Island University. It features a heritage rhododendron collection and acres of tall cedar and Douglas firs trees. The Gardens also offer a traditional English Tea service in the historic Milner House, with an unsurpassed view of the ocean. 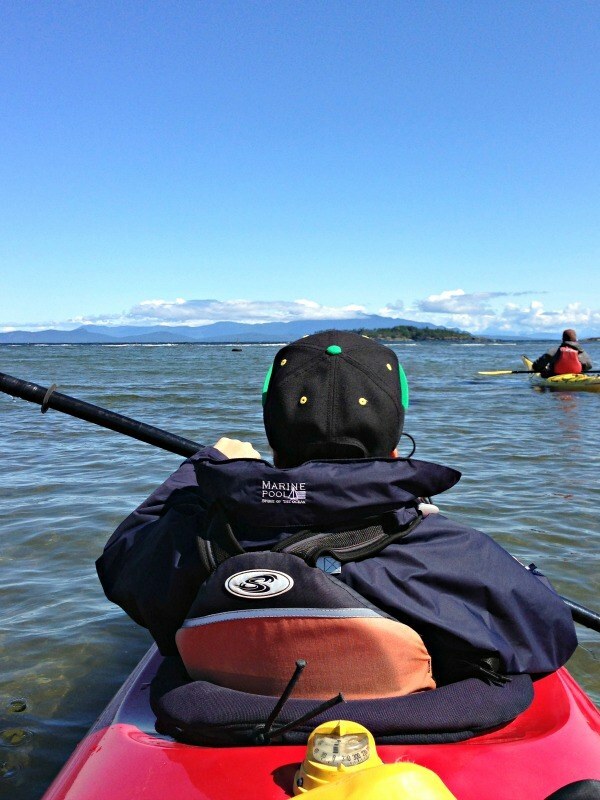 Ocean kayaking is a wonderful family adventure. It’s a great physical workout (especially for teens in a solo kayak), and you might get a chance to get up close to sea lions and other ocean creatures, and if you’re lucky, even whales. What an unforgettable West Coast experience! Are you afraid of the dark? Then Horne Lake Caves is not the place for you. 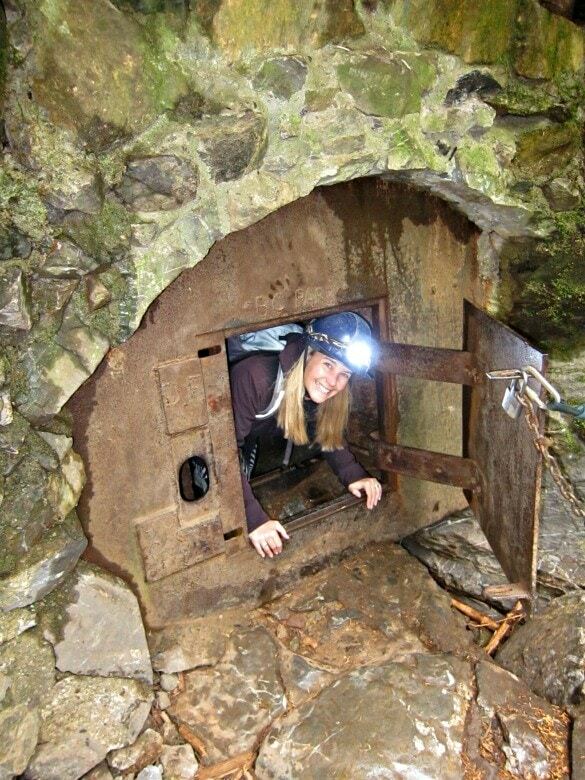 But if you can handle the confined spaces, this incredible, underground wonder that you can only see when your headlamp is turned on is unforgettable. There are family tours of the caves, and for the really adventurous, a rappelling tour. Gulp. 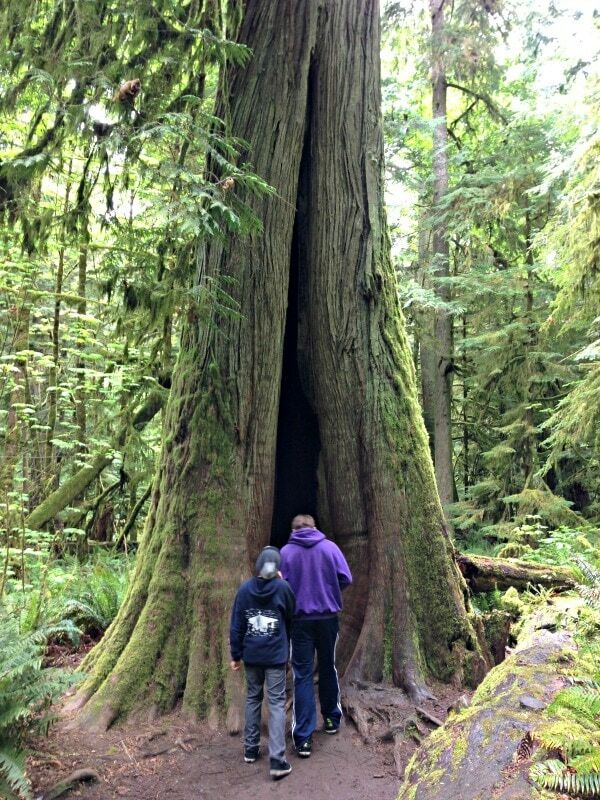 A 30-minute drive west of Parksville brings you to the awe-inspiring world of giants: Cathedral Grove Provincial Park. This park is home to some of the last remaining old growth Douglas fir trees in the province. Trails on either side of the highway allow visitors to wander through the forest and around the trees themselves, many of which are 20+ feet wide. For a splurge-worthy stay, make a reservation at Tigh-Na-Mara is a rustic holiday resort, but with all of the luxuries. Whether you want an oceanview room or a family-style cottage complete with a kitchen, the resort offers something for every travelling style. Spa lovers flock to the resort’s Grotto Spa, voted as the best spa in Western Canada. From the resort it’s a short walk down to the beach, when you can spend the entire day or attend an evening beach campfire barbecue. Budget-seekers will want to bed down at Beach Acres, a traditional family resort with charming individual cottages and self-contained units with kitchen facilities. Its unbeatable beachfront location and laid-back vibe combine to create total vacation relaxation. 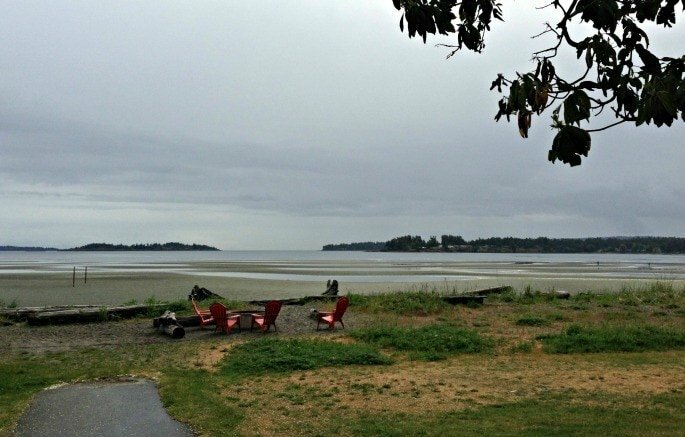 Camping families flock to Rathtrevor Beach Provincial Park, a personal favorite. This campground is situated near two beaches—one rocky, the other sandy—with a tide that goes way out into the Straight. Perks include playgrounds, showers, hiking and cycling trails throughout, and a Nature House. What appeals most to you about the Parksville Qualicum Beach area…the beaches, caving, hiking…or the goats on the roof? Let us know in the comments below! 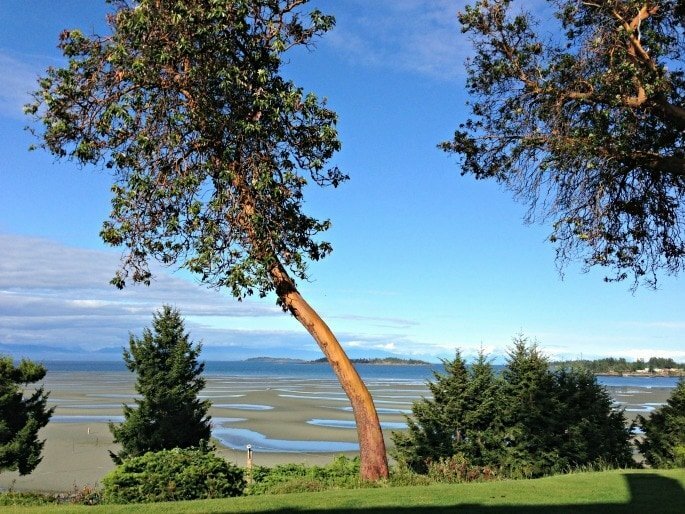 A Note from The Curious Travel Mama: Thank you to the Parksville Qualicum Beach Tourism Association for hosting my visit. All opinions are mine, as always. All photos by Claudia Laroye. Great post! Can’t wait to visit those goats! The goats are great, and the Coombs Old Country Market is really one-of-a-kind! I visited Vancouver once and found it full of things to do, but I knew nothing of this unique area. This is a real “find” – lots of adventures and pleasant surprises. Thanks for your comment, Ellen. I loved the beginning of the article! Sounds like my kind of a place. 🙂 I love that tree cave photo. I feeling like stepping into the picture. Thanks for your comment, Renuka. We just went to Parksville for the first time last summer and loved it. I only wish I read your article sooner as I would’ve loved to hike through Cathedral Grove Park and tried caving. Next time!